To cut the long story short, after spending a few days in my parents’ village and visiting relatives there, we leave for Banda Aceh by road. One of my aunties who owns a car rental business is very kind to lend us a car with the driver to drive us to Banda Aceh, free of charge. So here we are, departing to Banda Aceh at 10 pm at night.. 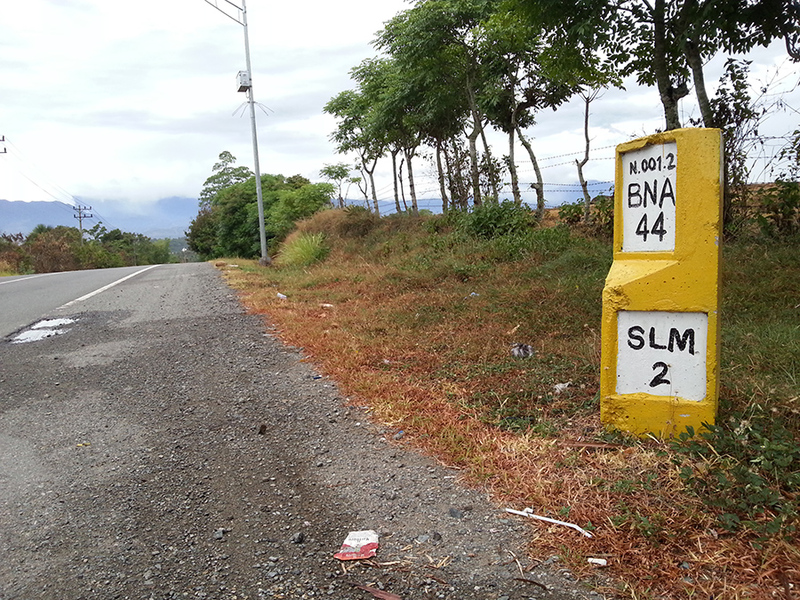 Still another 44km to go to Banda Aceh.. 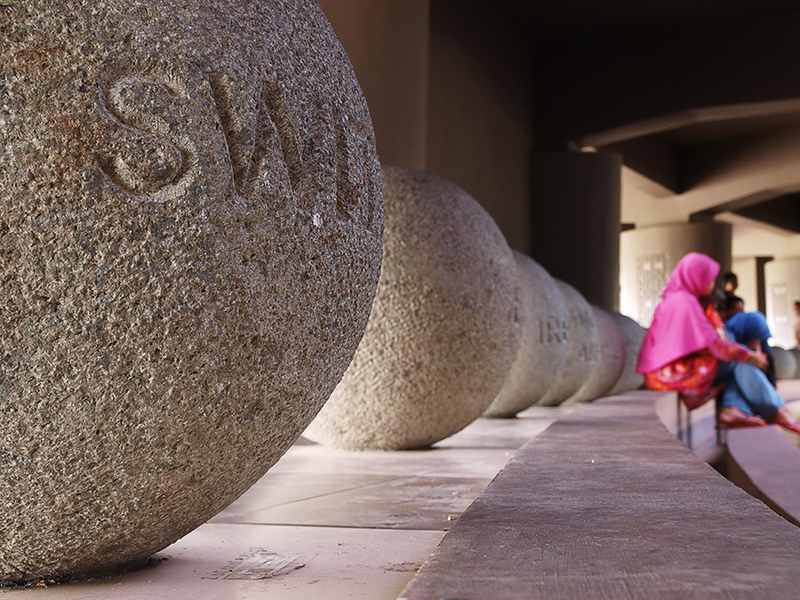 Arriving in the morning at Banda Aceh, the similar impression of freshly reconstructed area is still felt everywhere. The main streets are neat and smooth. Many of the buildings still look new. It’s normal though, because Banda Aceh is one of the worst affected cities in Aceh when the tsunami hit Aceh in 2004. 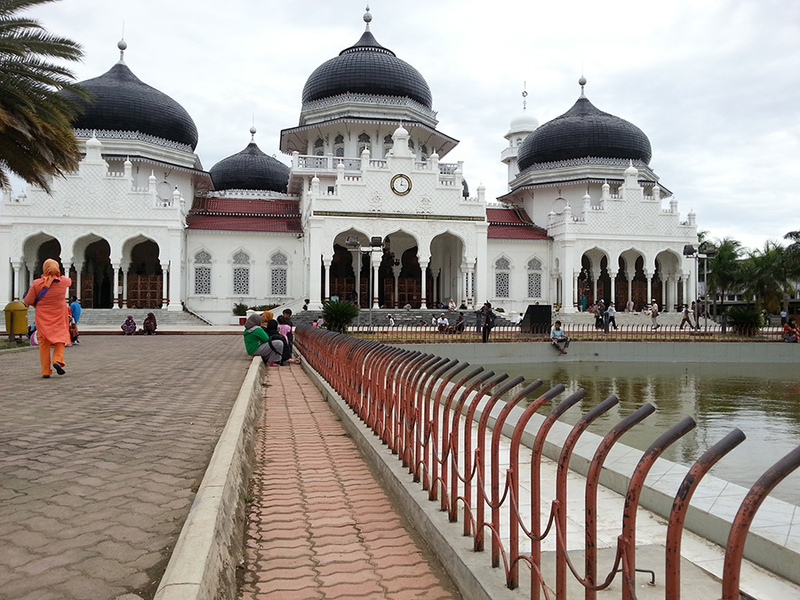 The iconic mosque of Banda Aceh, Baiturrahman, has returned to normal. Majestic and bright, visited by many people. Most of them come for prayers, and there are also tourists who want to admire the beauty and grandeur of the mosque that every Aceh people is proud of..
Baiturrahman, the iconic mosque of Banda Aceh..
One of the places that tourist must visit in Banda Aceh is certainly the Aceh Tsunami Museum. Designed by Ridwan Kamil, this four-story museum is full of memorabilias, photos of post-tsunami conditions, events & reconstruction, maps, mockups. The design of the building itself, its halls and chambers, is full of symbolic meanings related to the tsunami itself, and the struggle of people of Aceh who rose and rebuilt from the disaster. At some parts of the building, such as at the ceiling of the main hall and at one of the courtyards, there are symbols representing the donor countries that provided relief and assistance in the Aceh reconstruction process. 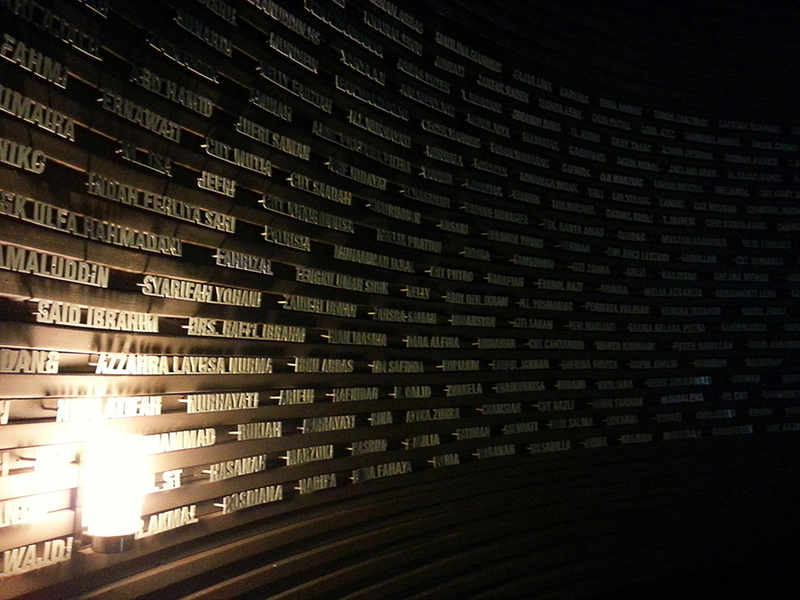 But the one that is the most memorable and touches me deeply is a cylinder-shaped chamber with reliefs of names of Aceh tsunami victims stamped on its walls, and with Arabic characters spelling for “Allah” on the ceiling..
Names of the tsunamy disaster victims carved on the wall..
We also visit another tsunami monument in town, around 2 km from Aceh Tsunami Museum. 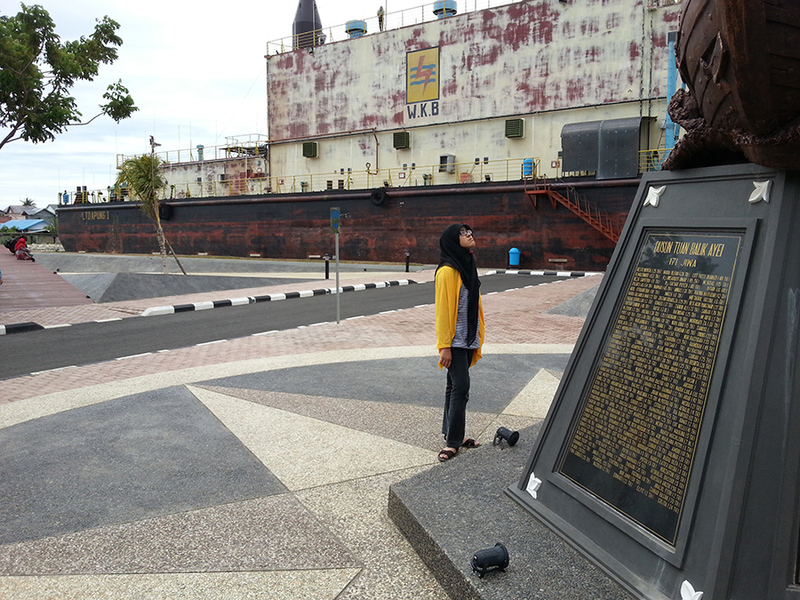 It’s the PLTD Apung monument, what was once a giant floating diesel power plant harbored at Ulee Lheue harbor, some 2.5 km from the place where it is located right now. Seeing firsthand how big the floating power plant is, imagining how powerful was the tsunami waves that lifted and threw the 65 meters and 2,600 tons of ship as far as 2.5 km from the beach into the middle of the town, has given me goosebumps. I really cannot imagine how could all those people, few of them are my relatives, get through the disaster and came back even stronger. Only chosen people can do that. PLTD Apung Monument in the background, was once a giant floating diesel powerplant harbored at the port some 2,5 km from where it is located now.. There are still many places to visit in Banda Aceh. But we have to hurry and head to Ulee Lheue port to cross over to Weh Island. I promise myself, someday I will return to this city, spend more time with my relatives here, visit places we have not had time to visit yet, to understand more of the root where I come from..